How sweet is Little V's newest jacket? Buttons(*sigh*). 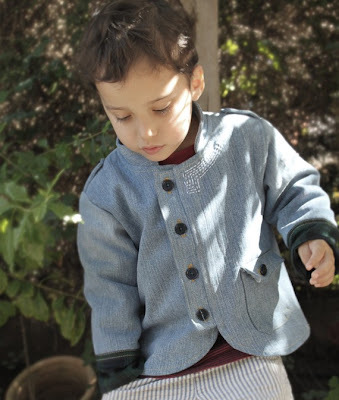 It comes in sizes 2- 6 years, is fully lined and there are options for different button arrangements at front. I was really impressed with how easily it went together. I was done in under two hours. The pattern is from a new Etsy shop called SepaDesigns. The owner is a former professional children's and women's clothing designer who wanted to get away from the behind-the-scenes of commercial pattern design and do something more hands on. She says she was inspired by the internet crafting and blog community to open her own shop. To enter the giveaway, visit SepaDesigns Etsy shop and come back here to leave a comment with the name of the pattern you'd like to win. A winner will be chosen via Random.org on Tuesday March 8th. Definitely the Rock n Roll jacket for my little guy! Love the Shoulder Knot Tunic! Perfect for the coming summer months! Thanks for the chance to win one of these great patterns! Definitely the girls cropped and ruffled jacket. 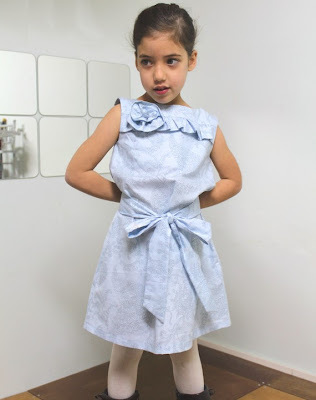 It can be made so many different ways using different fabrics and patterns. I love the rock n roll jacket. crop and ruffled Jacket! WAy cute!! 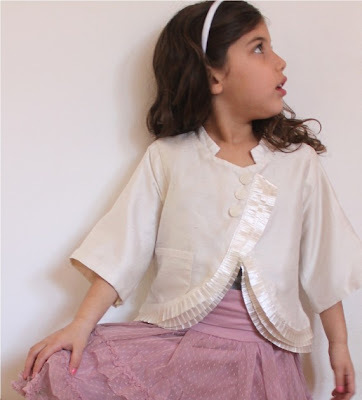 Girls cropped and ruffled jacket please - gorgeous! I really love the ruffled jacket, but the girliest dress is so pretty. Either one would be wonderful. I am in love with the cropped jacket! I'd love the girl's cropped and ruffled jacket! Cropped and Ruffled Jacket, by far! Thank you for introducing me to this great shop! It is actually really hard to choose a favorite... but if I must, I guess I'd want the boys jacket. And check out those beautiful models! Love the shoulder knot tunic! The Girl's Cropped & Ruffled Jacket is super cute! I love both the little jackets, but I think the cropped and ruffled is my fav. You did a great job putting it together. So cute!!! Loving the peace out hoodie! The "girliest dress" I think would make a sweet Easter dress,so I would pick it, but all the patterns seem super cute! I'm a sucker for jackets.The rock and roll jacket is my fave with the cropped and ruffled jacket for second place! The Rock and Roll jacket is so cool! I just made her shop a favorite on Etsy. Thanks for the introduction. I definitely would like the cropped and ruffled jacket pattern! It would be a total challenge for me, but I love how cute it is. Thanks for the giveaway!! Love the ruffled cropped jacket! The Girliest Dress would be perfect for my granddaughter. She has such a cute shop, I love this dress The elegantly shift"y" dress. Wow, great patterns but I have to say I adore the girliest dress pattern. So cute, and think could even make in a heavier fabric and wear over a long sleeved top and tights for cooler weather. Gorgeous. I love the cropped Ruffle Girls Jacket, see many great combinations there!! Girl's Cropped & Ruffled Jacket is so sweet - so hard to choose! Darling! I'd like to try the Shoulder Knot Tunic. Oooooh, I hope I win! If I do, I want the girls cropped and ruffled jacket. Thank You! Definitely the Girl's Cropped & Ruffled Jacket! Rock N Roll Jacket! I Love it and my son would be soo handsome in it!